The White Paper covers the history of mobile web evolution in the last 12 months, the methodology of the study, and how to interpret the results in a way that guides online publishers to employ better mobile web strategies for the future. 25% of the analysed websites that didn’t appear as mobile-optimized in April 2015 have since gone on to implement some kind of mobile optimization strategy. Of these, the majority - 85% - have used responsive web design to go mobile. Appticles performed two time-lapsed studies that looked at the state of web development targeting mobile devices across a vast swathe of the marketplace, providing insights into how mobile support operated before Google's algorithmic change (April, 2015), the reaction of businesses after the change, and the potential impacts of future changes on development methods. Appticles.com is the mobile publishing platform that empowers online newspapers and magazines to package their existing content into mobile & tablet applications that run directly in the browser, thus eliminating the need for an App Store. "An unprecedented demand has been unleashed on the web for a swift solution to Google’s move and, as anticipated, site owners have responded with urgency and approached the situation in various ways," said Ciprian Borodescu, CEO at Appticles. "25% of the analysed websites that didn’t appear as mobile-optimized in April 2015 have since gone on to implement some kind of mobile optimization strategy. Of these, the majority have used responsive web design to go mobile." 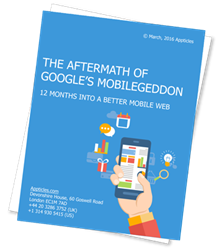 Titled “The Aftermath of Google’s Mobilegeddon”, this white paper notes that of the 42% of web entities who had no support for mobile devices, a quarter of those had adopted a mobile strategy of some sort. This still left a sizable chunk - 31.5% of the total sample - failing to keep pace with the technology of their users. The downward shift in null compliance was inversely mirrored by an increase of 8.56% in sites using responsive web design. The average Google PageSpeed Insights scores increased dramatically with 30% more sites achieving a score above 60. News sites saw one of the most unusual shifts: those that already catered to mobile web users became 530% more likely to have a mobile application available for download. To download a complimentary copy of the white paper, register here. Appticles.com empowers online publishers to directly engage their mobile users by vastly simplifying the technical aspects of having an application and eliminating the need for an App Store. In other words, Appticles allows publishers to package their existing content into mobile & tablet applications that run directly in the browser. That easily translates into a significant increase in mobile user engagement, which ultimately means more revenue opportunities for online publishers. As an extension of its platform, Appticles currently owns the 2nd biggest WordPress mobile plugin on the market with close to 900,000 downloads.